A train hit and killed five elephants and a foetus in Ganjam distric of Odisha state in India. 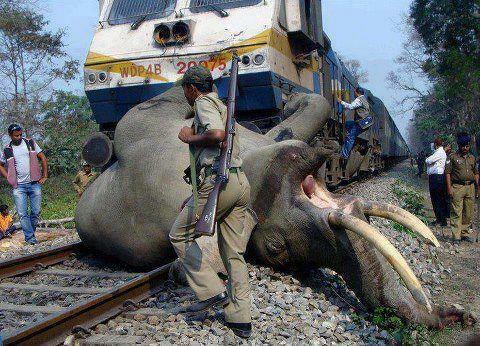 The elephants - three females, a tusker; a calf besides a foetus - were killed after being hit by the express train. One of the female elephants was in the advanced stages of pregnancy and the impact of the hit forced the foetus to come out! The elephants were crossing the railway track when the train hit them one after the other, killing them on the spot. How insane is that! What is the wisdom behind putting railway tracks through the middle of the jungle? Even if it was at all needed to lay railway tracks through the jungle, the government must have taken safety measures for the animals to save then from this untimely, cruel death. Again this shows the insensitive and indifferent attitude of humans towards animals of the world. We are worried only about ourselves, exploiting all available resources to make our lives better. We have become so self-centered in our efforts to enjoy luxuries of life that we don't care about other forms of life on the planet. However, we must remember that if there will be no animals left on earth, we will perish too. Anyway I'm adding this RSS to my email and can look out for a lot more of your respective exciting content. Make sure you update this again soon. Hi, i feel that i saw you visited my blog thus i came to go back the prefer? .I'm attempting to to find issues to improve my site!I guess its ok to use a few of your ideas!! Yeѕ! Finally ѕomething about sqlp. I say… I hesitate a lot and never manage to get nearly anything done. I mean, I don't wish to tell you how to run your blog, however suppose you added something that makes people want more? I mean "Elephants Crushed by Train" is kinda vanilla. You might peek at Yahoo's home page and watch how they write article headlines to get people interested. people interested about everything've written. In my opinion, it would bring your posts a little livelier. Greetings! I've been following your site for a long time now and finally got the courage to go ahead and give you a shout out from New Caney Texas! Just wanted to say keep up the good job! Excellent post. I am facing many of these issues as well.